Reggie is a one-year-old neutered male who weighs only 11 pounds. He’s a small breed mix dog who is looking for that special person or family to give him a lifelong loving home. Reggie loves, loves to play with toys. He will zip around in delight at a squeaky toy. He gets along very with other dogs and loves his treats. He is learning to walk nicely on a leash and is a great age to participate in behavior training classes. Reggie will be a wonderful companion for that lucky person or family that adopts him. K-9 PALS is providing sponsorship for this wonderful little dog. 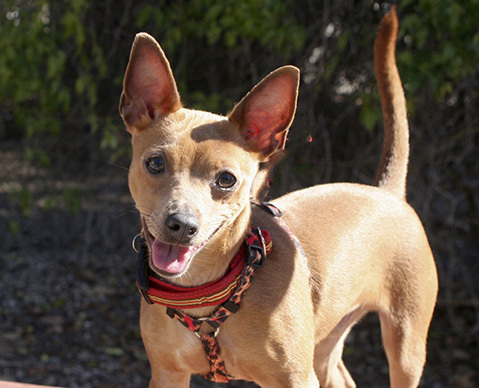 If you are interested in adopting Reggie, call 805-681-4332, at Santa Barbara County Animal Shelter, 5473 Overpass Rd., Santa Barbara, CA, during business hours, Mon-Fri 9 – 4:45, Sat 10 – 4. Reggie can also be seen at community outreach and adoption events, (that is, until he gets adopted). To view more photos and information on other dogs available for adoption, go to the K-9 PALS website: K9PALS. K-9 PALS provides free dog behavior training sessions for people who have adopted a dog from any local shelter, rescue organization or humane society. K-9 PALS – K-9 Placement and Assistance League, Inc.- is the all-volunteer, no-kill, non-profit 501C3 organization dedicated to providing humane care, forever homes and advocacy for homeless and abandoned dogs in Santa Barbara County and beyond. All donations to K-9 PALS go directly to benefit homeless and abandoned dogs of our community in order to save lives, and find forever homes for them. Information on K-9 PALS is available at K9PALS, or 805-570-0415, or info@k-9pals.org or at K-9 PALS, P.O. Box 60755 Santa Barbara, CA 93160-0755.